Alun-alun Kidul­ is a southern region of Yogyakarta Palace. 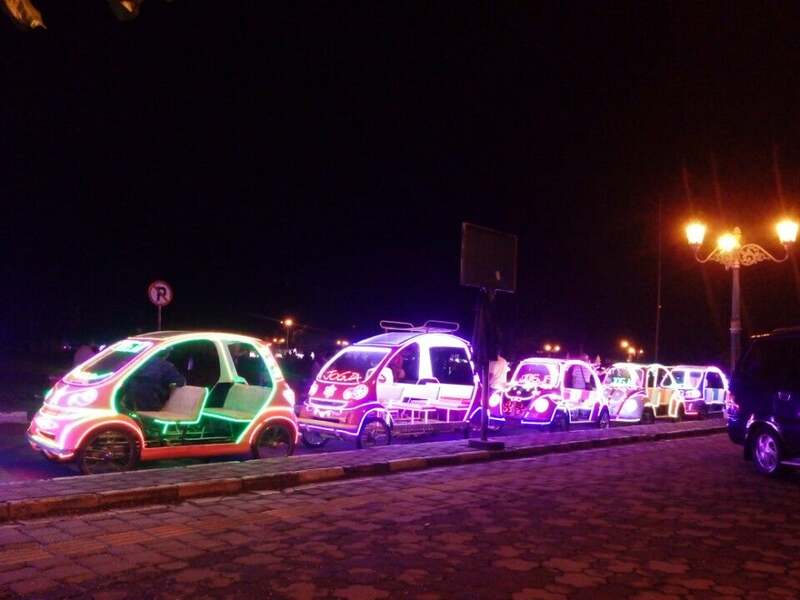 Many activities could be seen in Alun-alun Kidul­. 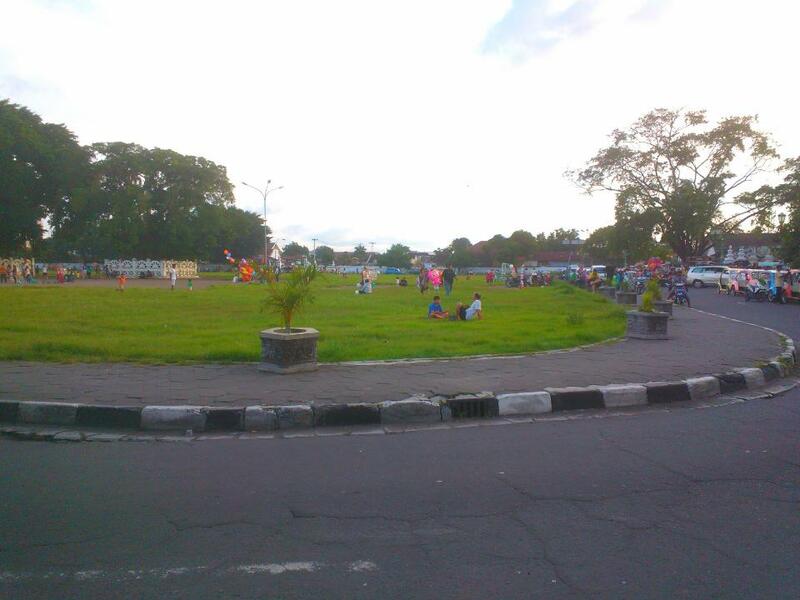 Approaching evening, Alun-alun Kidul­ becomes an interesting recreation place. Why Alun - Alun Kidul is special ? Alun-alun is a Javanese architectural term for the large central open lawn squares common to villages, towns and cities in Indonesia. Commonly, alun-alun in modern-day Indonesia refers only to the two large open squares of kraton palace compounds. Each kraton has two alun-alun: the most important and northern alun-alun lor and the less important and commonly smaller southern alun-alun kidul. Alun-alun Kidul (Southern City Square)­ is the back yard of Yogyakarta Palace. The backyard of the king's palace is a place full of stories. Two of the folklores most identified with the Southern city square is its establishment; the city square was built to make the back side of the palace looks a lot like the front yard so that it doesn't stand backing the Southern Sea which is believed to be guarded by the Queen of the Southern Sea, who is said to have a mystical connection with the King of Mataram. The second story is the myth of walking pass the twin banyan trees planted on the city square, with eyes blindfolded. 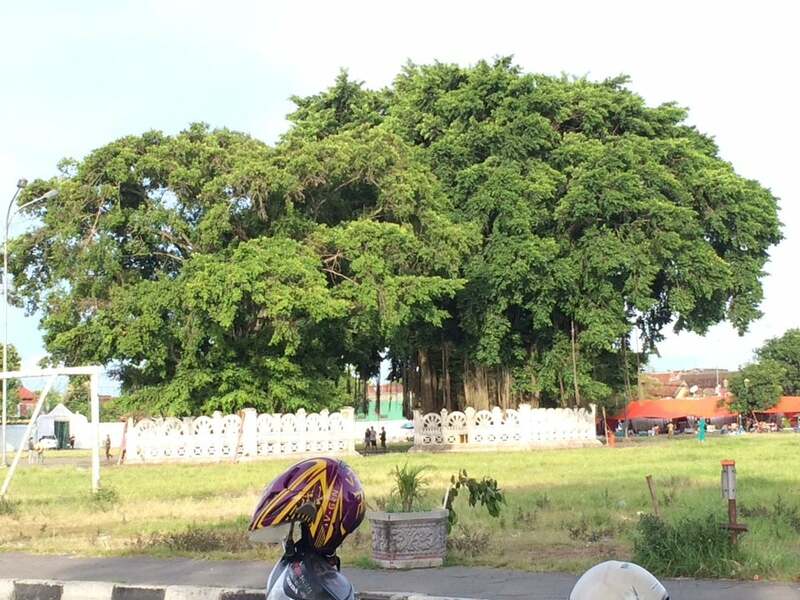 The game is known as masangin, which stands for "masuk dua beringin" (entering two banyan trees). What to explore at Alun - Alun Kidul? There are many other things you can do in the Southern city square. Formerly used by the kingdom's army to work out, the place has now transformed into a public space flocked by visitors; people of all communities and ages are gathering here. In the evening, started at about 5 pm, parents take their children to play around, running all the way chasing the flying bubbles from liquid soap blown by the sellers, or shouting loudly as if calling out the various kites above the sky. Quite at the pavement, numerous sellers are getting ready and spreading out their mats. Later at night, the atmosphere starts to change; the young children have gone home, and it's time for the teenagers to spend their night over at the city square. The darker the night, the higher the crowd. 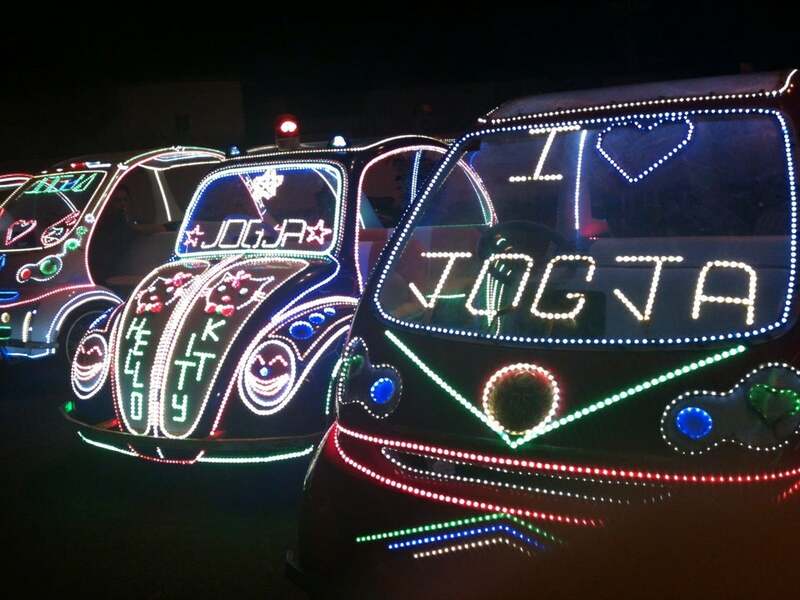 Tandem bicycles and lighted odong-odong become the favorite objects. While doing sport by riding on the bicycle or odong-odong, you can also feel another sensation while riding on it cross the crowded street. How to get to Alun - Alun Kidul? 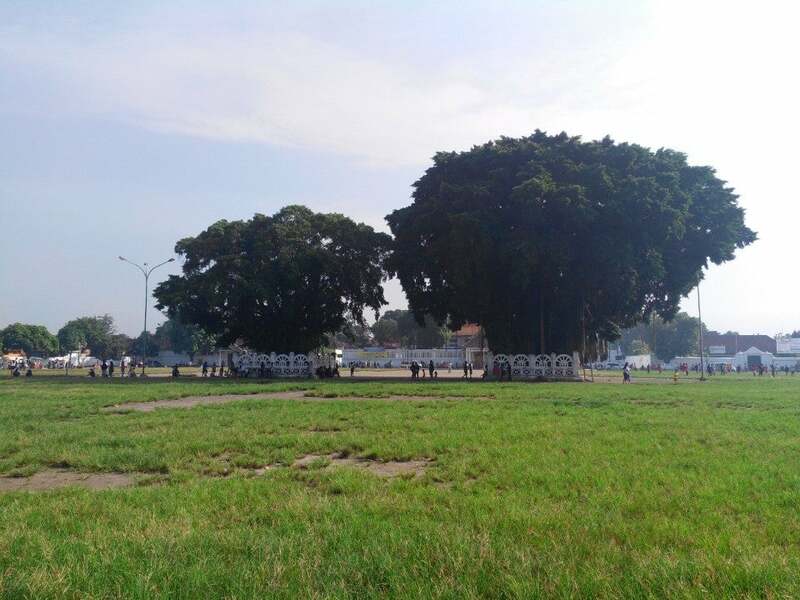 Alun-Alun Kidul is 1.6km from the Place of Yogyakarta (Kraton Yogyakarta). You can reach Kraton Yogyakarta by train from Maguwo station to Stasiun Yogyakarta, Kraton Yogyakarta is 2.2km from Stasiun Yogyakarta. You can also take bus route 1A from the airport to Kraton Yogyakarta, it costs IDR3,000 for a ticket. Continue by walking south you can reach the place. If the place you're staying isn't that far and it's a clear night, ride a becak to there. The rented bikes are cute but could be quite costly if you can't negotiate well. There is also some people who rent out blindfolds and you can try and walk blindfolded between the two trees. According to Javanese mystics, the person who can do this will never wander astray in life. At night there are lots of warungs (food stalls) which set up here, and you can sit on rattan mats and watch the buskers and crowds of locals go wandering by. If you want to buy somethings here, like food or drinks, you should ask the price in advance. It's easy to be cheated if you're a foreigner. You should avoid using car on Saturday or Sunday evening as it's hard to find a parking spot. It's better to walk or use motorcycle or bike. 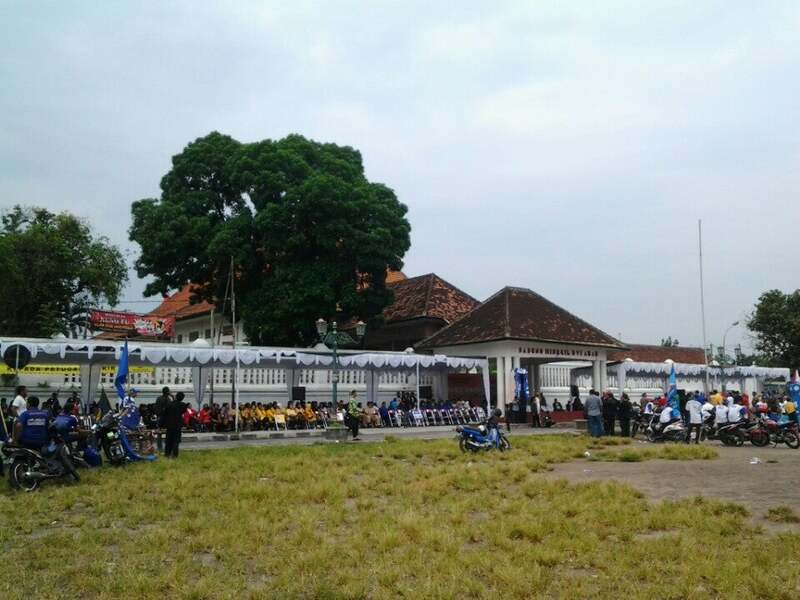 South Square is located behind the Kraton. The place is always filled with people who are looking for cheap entertainment. This is a public park behind the king palace. In the evening is the best time to visit here, where you can see glowing bicycles and crowds relaxing and gathering with their family. The most interesting part about this place is in the centre of this park, where you trying to walk passing two trees with your eyes bring covered, that located about far and made quiet big gap between those trees. People's says if you could walk pass through those trees than you have clear heart but if you can not then try again next time.. the gap between those two trees are quiet big but you can believe it or not. Not many people able to pass through that challenge.